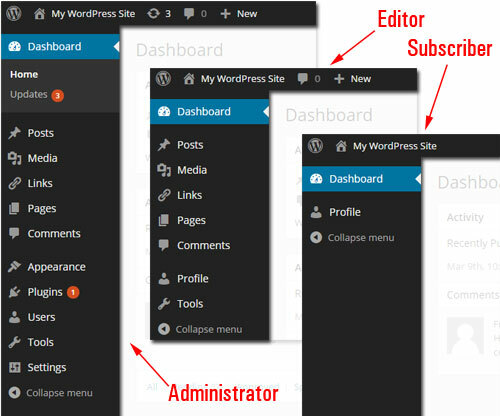 In this step-by-step tutorial you will learn how to navigate around the WordPress admin area and master using the WP dashboard, the WP administration menu and the main administrative modules of your website. 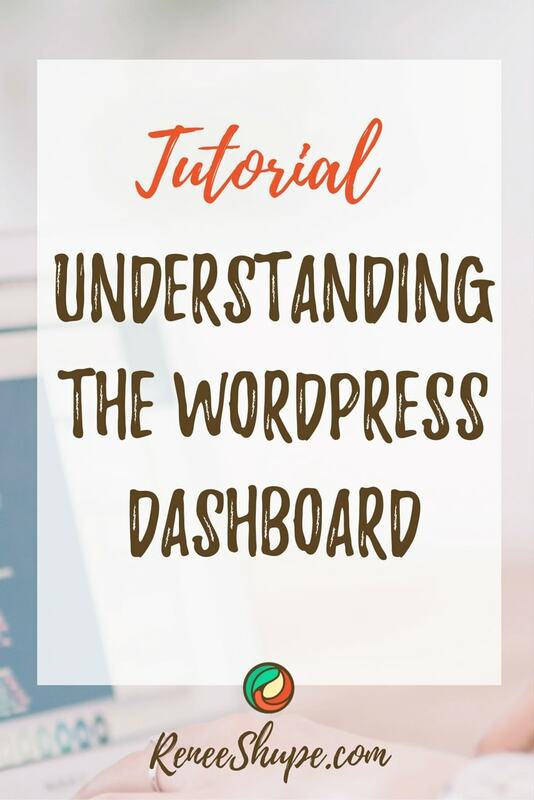 You will also discover some of the “hidden” features of the WP dashboard that will become more useful to you as you become more skilled at using WordPress. 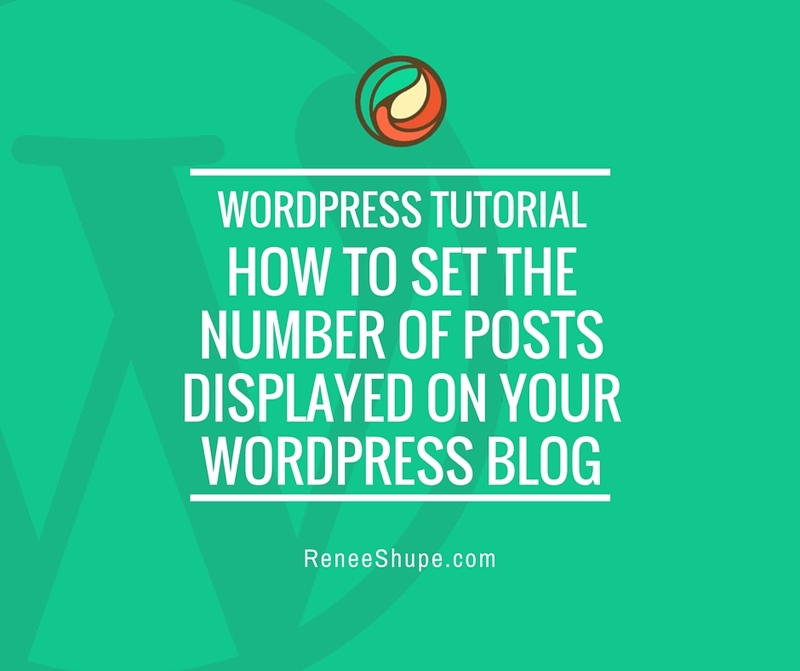 Note: This tutorial assumes that you already have installed a WordPress site on your domain and that you know how to log into your website or blog. 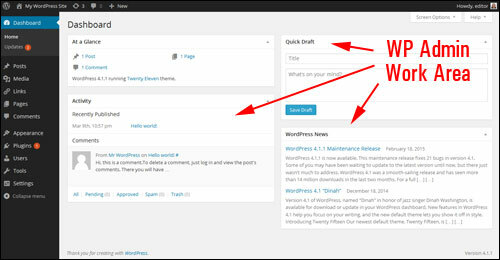 If you need help logging into WordPress, see this tutorial: How Do I Log Into My WordPress Blog? 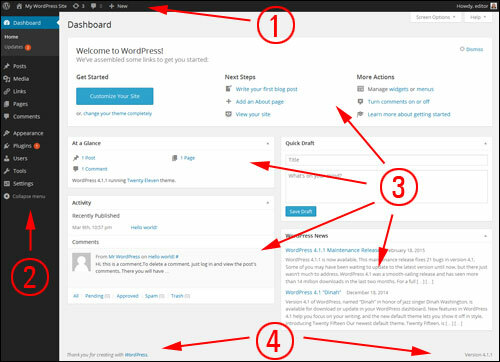 Once you’ve logged into your WordPress site via the login form, you should be presented with the WordPress Dashboard, which is your site’s admin area. 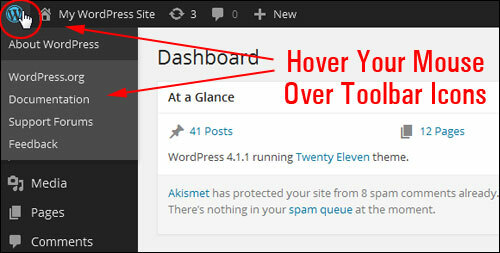 Your WordPress administration section is where all of your site’s administration is controlled from. Useful data and information about what is taking place on your site. 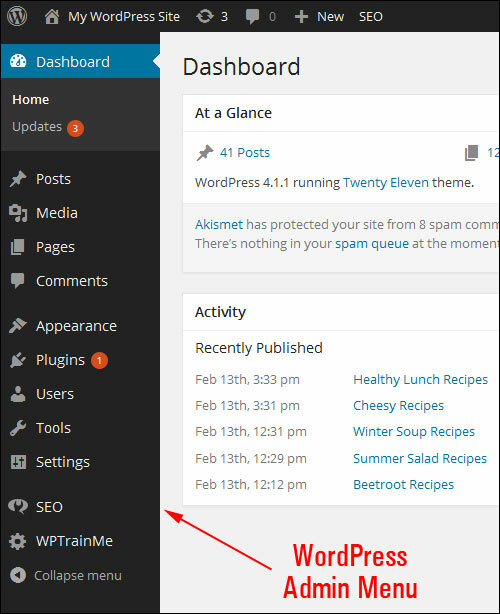 It also provides you with “at-a-glance” metrics and reports about recent activity taking place on your site, system updates and notifications, and to be kept updated on the latest news from the WordPress community and various WordPress-related resources, such as notifications and announcements from WordPress product vendors of plugins and themes that you have installed on your site. 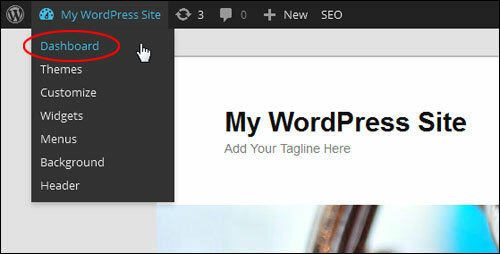 Management and control of all website settings and options. 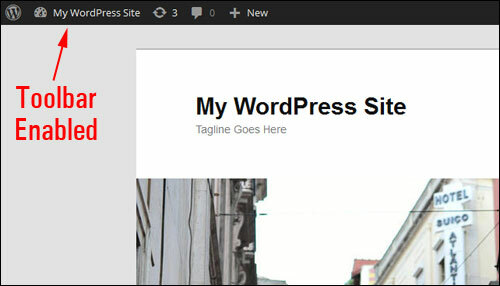 Features that let you modify, expand, update and enhance the design and functionality of your site, upgrade plugins and themes, and add, modify and delete content or content sections. 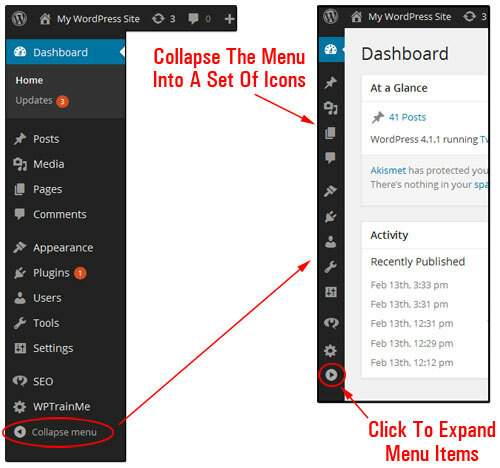 Go through the step-by-step tutorial below, then, to learn more about using your WordPress Dashboard and your site’s main admin sections. 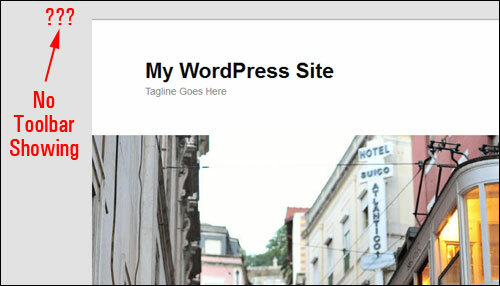 Even though this new design was mostly cosmetic and aimed at giving WordPress users and developers cleaner typography for a better optimized mobile and desktop viewing experience and a more aesthetic experience, it also affected much of the existing WordPress documentation around the web, including thousands of tutorials and articles about WordPress online, in print and on video that are now in need of being updated. 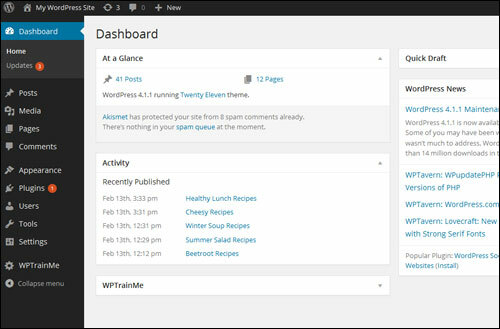 With the ability to customize the look and feel of your dashboard, you can now expect to see other design changes to back-end features when WordPress releases new versions. 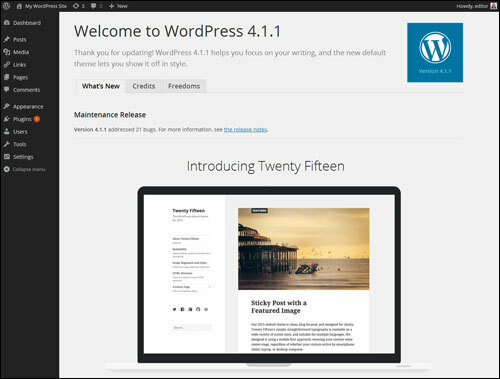 If any new versions of WordPress include changes to any of the functional aspects or features of the software, then rest assured that we will keep you informed about what’s new here. 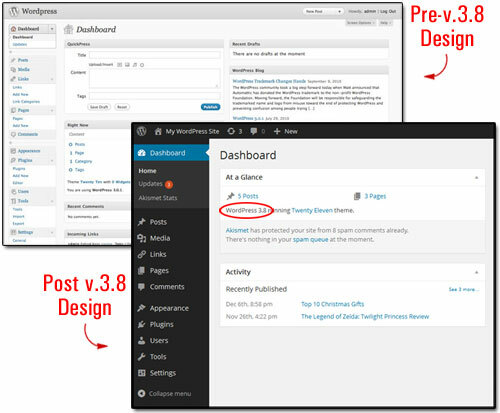 Important: If your website runs on an older version of WordPress 3.8, then make sure you upgrade to the latest version immediately, as newer versions of WordPress contain many bug and security fixes. 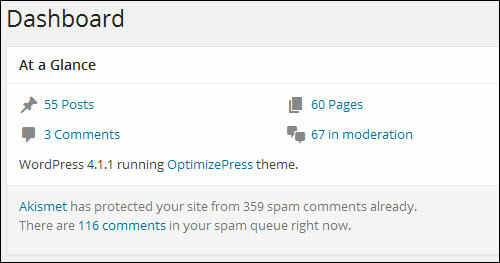 Depending on whether you or someone else manages your site, you may or may not see the messages below. 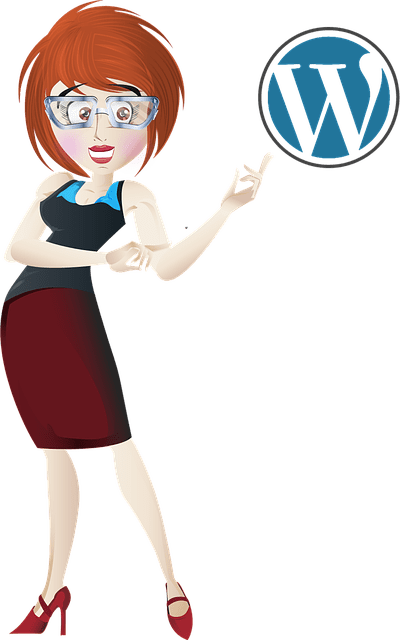 If you are new to using your website and want to spend a little time learning more about WordPress, just click on the “Get Started” or “Next Step” links. 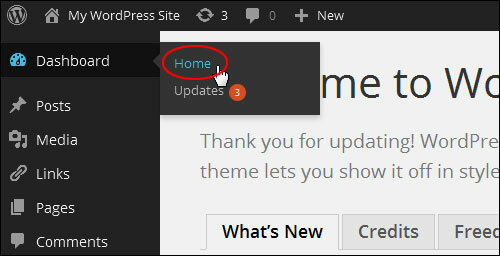 Feel free to explore the information displayed in the “welcome” message if you want to learn about new features and updates to the software. Tip: Some web developers or designers may choose to hide elements from displaying in your admin area because they may know from experience that most users won’t be using to access these features, or simply to give sections of your site a less “cluttered” look, or to prevent accidental errors from happening. If you are looking for a particular functionality or information block in your control panel and can’t find it, or don’t know where to look for it, just try clicking on the Screen Options tab … you may just find what you were searching for! 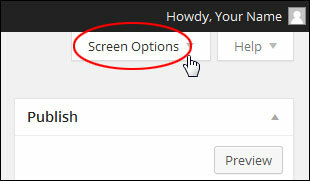 Like the Screen Options tab, the Help tab also displays context-specific information. 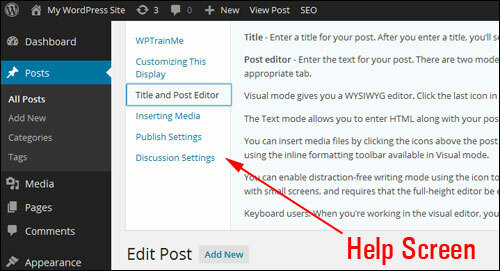 Tip: To learn more about a particular area of WordPress while logged into the administration area, click on the Help tab. You can also view what effect any changes you make to your pages or content will have on your site as seen by your site visitors. As long as you remain logged into your admin area, the toolbar will continue displaying on your screen while you’re viewing the “front end” of your site. 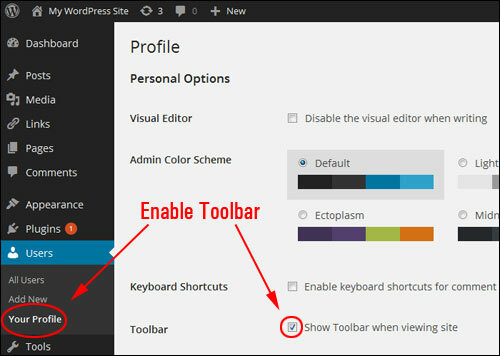 Important: If you are logged in and the Toolbar is not showing when viewing your site, then make sure that the Toolbar has been enabled on your site. 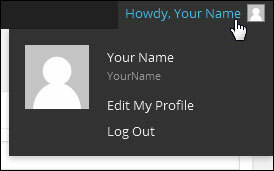 At the far right-hand side in your admin area is the “Howdy, User” section with an image of your Gravatar. Keep in mind that what users see inside the Dashboard area when logged in depends on the role and capabilities assigned to them and how the site administrator has configured settings and options for different features. 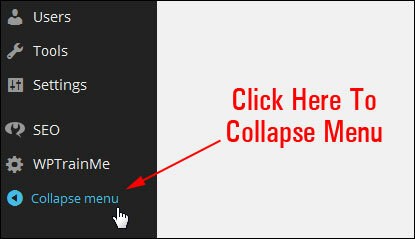 Irrespective of the role assigned to a user, some admin menu items like “Collapse menu” remain accessible to all. 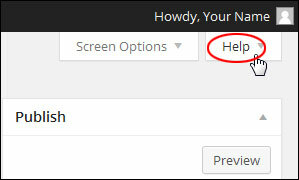 This is a useful feature if you want more space in your admin working area. 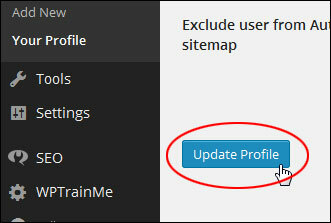 We plan to provide helpful tutorials about each of the navigation menu items in future blog posts. 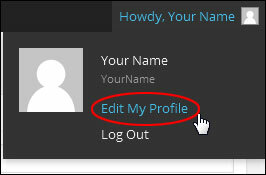 Fortunately, you can customize your admin area by hiding, minimizing and reorganizing the layout and display of your your information sections. Congratulations! 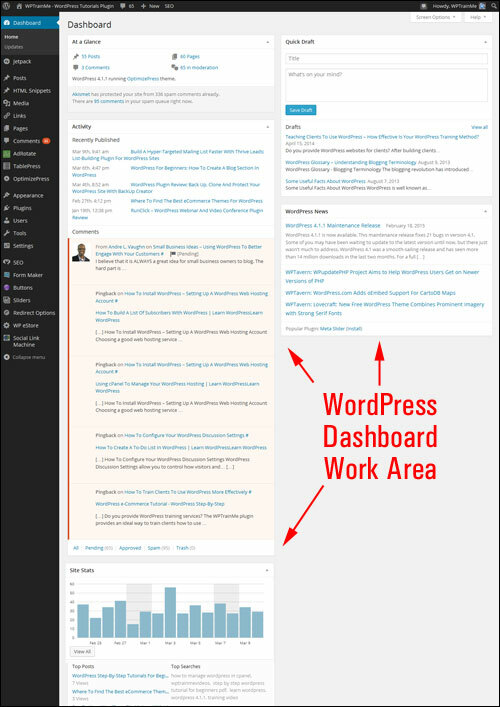 Now you know how to use your WordPress dashboard and administration areas.